Within months of becoming Nashville's director of schools, Dr. Shawn Joseph faced a series of legal and ethical questions. 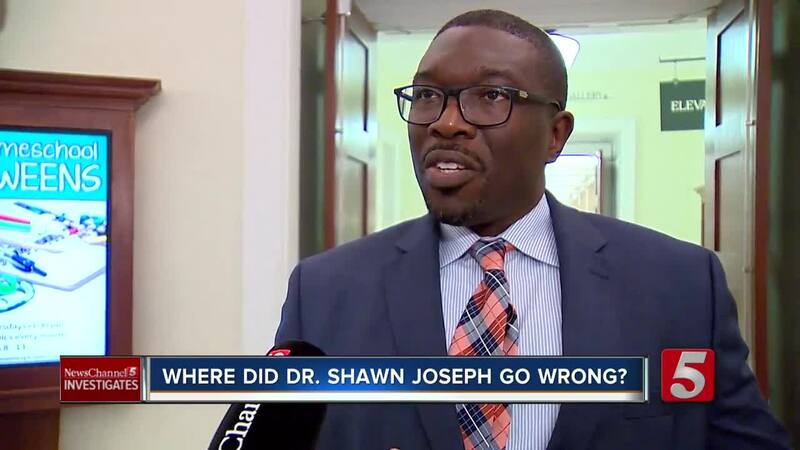 NASHVILLE, Tenn. (WTVF) — It's the end of the road for Metro Schools Director Dr. Shawn Joseph -- a road dotted by legal and ethical potholes. Under the terms of his buyout deal with the school board, Friday, April 12, is his last day. But Joseph's journey as Nashville's first African-American director of schools began in July 2016 amid high expectations -- with the school board essentially giving him a blank check. "I think that Dr. Joseph needs to do whatever he needs to do to make sure that we are successful," then-chair Anna Shepherd said. Within months, there were ethical questions. When NewsChannel 5 Investigates asked about the qualifications of the people he brought with him from Maryland, Joseph directed staff not to answer those questions - saying the district should wait and attack the reporter's methods. A school maintenance worker was also directed to work on Joseph's house. An email showed he would be "on the clock," working at taxpayer expense. Joseph blamed his assistant. "I hold myself to the highest level of integrity," the schools director told NewsChannel 5 Investigates in October 2016. We asked, "So where did she get the idea that he would be on the clock? Did that come from you?" "No," he insisted, "and that's what I corrected it in an email." Joseph still ordered the man's supervisors to allow him to modify his work schedule to work at the director's house. That fall, our investigation caught the schools director using a bus driver to chauffeur him around town -- including for personal errands -- with taxpayers paying for the driver to wait and wait . But when we tried to show him the video, he walked out of the interview. "This is one of the few districts where I've ever worked where the number of vacancies goes up instead of down," former Metro Schools administrator Mo Carrasco told NewsChannel 5 Investigates in December 2017. "People are leaving. People are not happy. And we keep saying to people that everything is great and we're making progress. We are not making progress." Those comments come just before Carrasco, one of the director's longtime friends, resigned amid a sexual harassment investigation. On his way out, Carrasco raised questions about how Joseph was spending the district's money. "I made a statement one day to some of the executive staff that we have too many contracts, too many consultants in the district," he added. "They are running into each other, and I don't think that was taken very well." Our investigation later discovered Joseph's team had hired consultant friends , sometimes without contracts, sometimes without getting the required board approvals . When two school board members, Jill Speering and Amy Frogge, requested an independent audit last April, Joseph lashed out, accusing them of behaving inappropriately and risking a potential lawsuit. "It's a lawsuit when you are inappropriately pointing people out and making comments that are not appropriate," he argued. Frogge responded, "I am doing my job, and I am not inappropriate." Last summer, two Metro Schools employees went public with horrific sexual harassment allegations against principal Sam Braden . The district's own files showed there was lots of evidence. Still, Joseph's team did nothing until after our investigation aired and then only under pressure from school board members. After repeated interview requests were declined, NewsChannel 5 Investigates tracked down the schools director. "Did you drop the ball?" we asked. "I did not drop the ball," he answered, refusing to answer any specific questions. To try to calm the controversy, Joseph later convinced the school board to sign a $100,000 contract with a Nashville law firm to review the district's Human Resources Department. Then, a secret recording caught him hinting to school bus drivers that they should vote against vice mayor candidate Sheri Weiner, potentially in violation of state law. In September 2018, new school board member Fran Bush had questions about Joseph's continued use of a school bus driver as a chauffeur while a bus driver shortage left kids sometimes waiting for long periods to get home from school. Our investigation discovered that Joseph's account of how he used the driver did not match records provided by his office. "I clearly think, at this point, learning about this information, we need to open up an investigation," Bush told NewsChannel 5 Investigates. As Joseph's relationship with a few board members continued to sour, our investigation uncovered new questions about his ties to a company that got a $1 million, no-bid contract in violation of state law. The district bought the student assessment software, then did not require schools to actually use it. Then, NewsChannel 5 Investigates obtained the law firm's confidential HR report, which warned the district is facing a morale crisis that threatens its ability to attract and keep good employees. And a group of teachers decided to go public, suggesting that Joseph's discipline policies were making their jobs harder. "Students are in school and they are disruptive and they are running through the halls and they are using profanity and hurting other students," guidance counselor Constance Wade said during a Teacher Town Hall. Through it all, the schools director never took personal responsibility for any of the controversies. In fact, he blamed NewsChannel 5 Investigates of trying to create hysteria over the sexual harassment issue. "Let me tell you, what I don't respect about you, my friend, is that you like to try to create unnecessary narratives on very important topics to try to create this hysteria," Joseph told us last year. More recently, he had suggested to support employees that they should not be airing the district's business in public -- a lesson he said his mother taught him as a child. "I told you about my mom with her little belt thing," Joseph said during a town hall hosted by the Service Employees International Union, Local 205. "She said, 'I wish you would tell somebody our business outside in the streets. We handle stuff right in this house.'"